Gradient PowerPoint templates, backgrounds Presentation slides, PPT Themes and Graphics. Let your presentations look amazingly beautiful with our Gradient PowerPoint Themes. 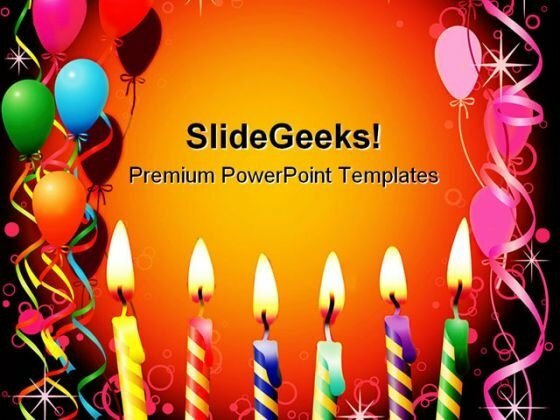 We have a great assortment of PPT themes available that can be downloaded by any business professional. Our designs are the proof of our attention towards our customer’s request. Professionals who work on the PowerPoint 2013 will understand the importance of gradient in a much better way. It adds value to the overall look of the presentation and makes it look more stylish. Apart from it, it makes it easier to extract information from the images. Our Gradient PPT themes are perfect tool to let the beginners (non-designers) the importance of it. We also have special designs available for school kids for their assignments such as Happy Kids Global, Butterfly Fish Animals, Rainbow Colors Wave, Back to School and many other designs. Just scroll your mouse on our themes section and you will find out how beautifully our designers have crafted these designs. "Microsoft PowerPoint Template and Background with party background with lighted candles and balloons" Tabulate goals with our Party Background Festival PowerPoint Templates And PowerPoint Backgrounds 0411. Download without worries with our money back guaranteee. Have some fun with our Party Background Festival PowerPoint Templates And PowerPoint Backgrounds 0411. They make creating ideas enjoyable.